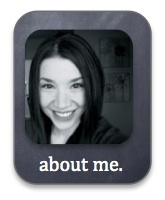 Every time I attend a conference, I have a mini identity crisis. When I attend math conferences, I thrive on the content and pedagogy shared. It’s amazing. My brain is filled with strategies and tasks that inspire and equip me to be better. However, sometimes I feel “too techy” because I can’t help but run low-or-no-tech strategies presented through my own experiential tech filter to think of ways I might implement the tasks/strategies differently in a 1:1 iPad environment. When I attend ed-tech conferences, I’m inspired by the capabilities of new tools, or ways to use familiar tools more effectively. While we all can agree that there are ed-tech tools out there that are complete junk, many also have huge potential. However, some tools with amazing potential leave me scratching my head… how could I use this in a math classroom? Or even… I wouldn’t use this in a math classroom… too contrived… doesn’t apply to *my* content area. I feel “too mathy“. True Confessions: Probably over a year ago, maybe more, pals on Twitter requested that I share about how I use Apple’s powerful tool, Keynote (cue the angelic voices from on high) to create math visuals. Folks wanted to know, how do you make this stuff, Yenca? I was invited to share on Global Math about Keynote creations for math… and I ducked out! 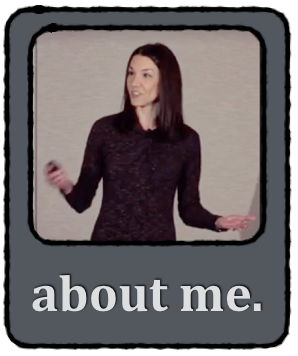 I felt like my sharing would disappoint people… that Global Math wasn’t the right place to share about this… that my sharing would be “too techy” for an environment that was “too mathy” to value what I’d planned to showcase. Given that I’m still perseverating about this (ha) I’ve wanted to find a platform to share what I didn’t share on Global Math that day. And… here it is! 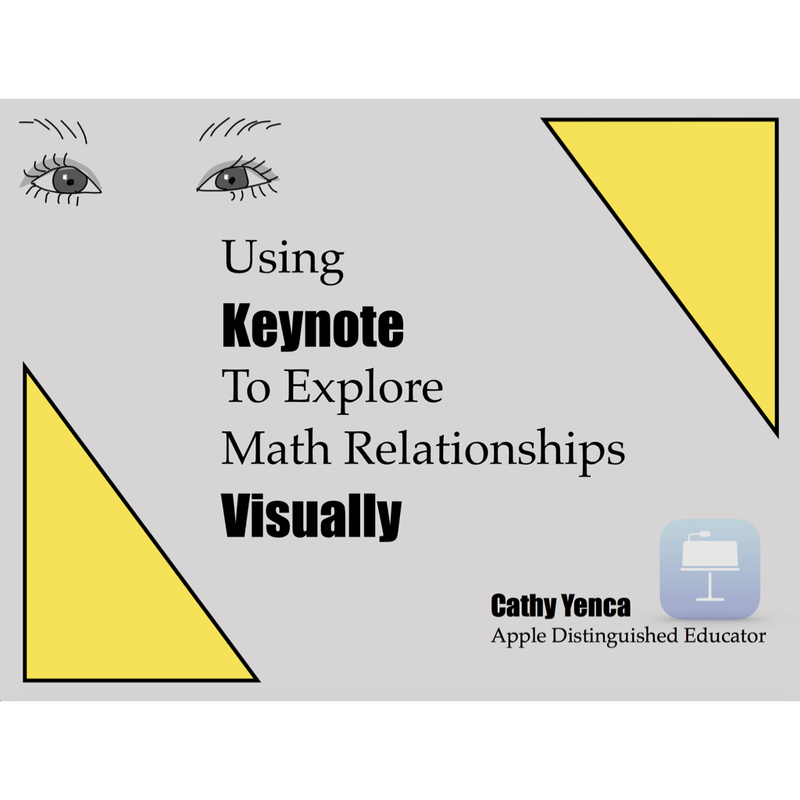 I’ve just published a brief, FREE-for-the-taking eBook entitled, Using Keynote To Explore Math Relationships Visually. It’s designed to be a quick, practical read for teachers, with the hope of extending math-visual-creating to our students too. I address *WHY* math visuals are important, and *HOW* to use some nifty features in Apple’s Keynote to create and even animate math visuals. I include examples for inspiration, and shout-outs to those who have created and/or implemented the use of math visuals, including Jo Boaler, Annie Fetter, Kyle Pearce, and Sara Vanderwerf. Finally, I challenge you, yes you, to CREATE and SHARE math visuals that promote student discourse and conceptual understanding. 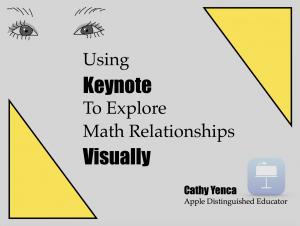 I suggest using the hashtags #KeynoteForMath and #EveryoneCanCreate to tag your goodies on Twitter so others can find and use them too. Grab the book here! I’ve also added it to the sidebar here on my blog (scroll down to see it) –> so it’s easy for folks to find. Because, you see, it’s okay to be purposefully mathy and techy. 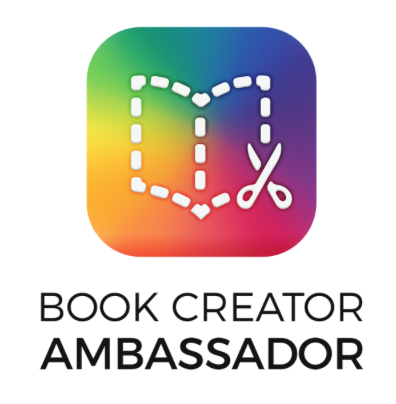 🙂 Thanks for letting me share about something I’m passionate about, AND I enjoy creating, and stay tuned for more by checking out the aforementioned hashtags. This entry was posted in Algebra 1, Pre-Algebra. Bookmark the permalink. 2 Responses to Too Mathy, Too Techy. This is great! More, more, more with keynote! 🙂 Thank you! Progress Monitoring With Nearpod "One Best Thing"